In 1983 the author, a Christian Businessman, arrived home from a sales trip to discover that his wife and three children had been brutally murdered. A year later he was convicted and sent to prison. He was innocent. In prison he met Henry Hillenbrand, known as the card man because he sold homemade greeting cards. 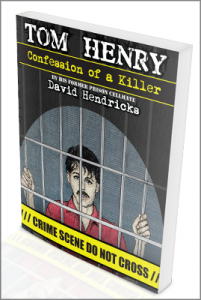 Henry told David an incredible story. In 1970, after murdering the woman he loved and the man he found her in bed with, he had executed a daring escape from jail by cutting through his cellblock’s iron cage and the bar of a window and rappelling from the third floor with a rope he braided from a sheet. During 13 fugitive years in Missouri, he had remarried and fathered two boys, defended himself in court, attempted suicide, converted to Christianity, and been recaptured by the FBI. In this book, the two imprisoned convicts endure riots, shakedowns, and gang extortion attempts while the formerly godless murderer—now a believer—dictates his story to the formerly Christian family man—now a skeptic. One is trying to get his story out; the other is trying to get himself out. Buy Now | Read a Free Preview!